The Corinthian Order, named so after the city of Corinth, was infrequently utilized by the Greeks in comparison to their Doric & Ionic orders, and its origin is vague simply because elements of the Corinthian Order were scattered throughout designs from a plethora of buildings. A fun myth of the order’s origin is described by Vitruvius about the Athenian sculptor, Callimachus. It is said that as Callimachus walked by the grave of a young Corinthian girl, he noticed a possession-filled basket placed atop the grave directly above the root of an acanthus plant. The leaves grew to surround the basket, which was topped off with a flat, square tile that protected the goods inside. This event is mythically said to have been the inspiration for Callimachus’ invention of the Corinthian capital, and interpretations of the capital have been sketched to show what Callimachus saw. The establishment of the Corinthian Order did not distinguish itself, immediately, as it was first incorporated within the Ionic Order capitals. The first noted example, at the Temple of Apollo at Bassae, appeared centrally among a troupe of Ionic columns, and this specific Corinthian-esque column holds much significance because the acanthus decoration was often linked with Grecian funeral celebrations; and the column may have been built to portray one of the many characteristics of Apollo, which was Sudden Death. Although the Greeks did not use the Corinthian Order as much as the Doric or Ionic, one of their earlier examples of Corinthian influence was at the Choragic Monument of Lysicrates in Athens; and arguably the most recognized model of the Greek Corinthian Order is at the Tower of the Winds. Because of the capital’s unconventional layering of acanthus leaves in only one row with only one row of water leaf designs above that, the Tower of the Winds capital distinguished itself from the Roman version of the order and, in turn, has become synonymous with the Greek Corinthian Order as a whole. The two are often interchanged in dialogue. 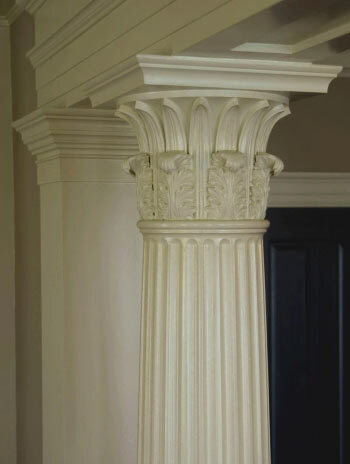 The Corinthian Order, similar to the Ionic Order, is classified by slender proportions and has a column height of 10 diameters, while the column shaft is predominately fluted (24) times around with the flutes being rounded off before meeting both the capital and the base. Post-Renaissance, Corinthian columns were also seen having no flutes. The column shaft terminates downward to an Ionic (or Attic) base that consists of two convex tori (an upper and lower ring) that are divided by a concave section called a scotia. The Corinthian capital is undoubtedly the most discernible aspect of the order, but details in the Greek version of the capital varied greatly because the acanthus plant has many species that reveal different-looking leaf forms. Standard, though, is the inverted bell-shape platform that is separated from the column’s shaft by an astragal molding. A single tier of identical acanthus leaves decorate the lower portion of the capital, with an upper tier of water leaves supporting a square abacus that has (4) concave sides that curved outwardly to a point. The only Greek exception was the Tower of the Winds capital that had a square abacus with no curvature. In some instances, on each face of the abacus, floral ornamentation – usually an anthemion or palmette accent – was centrally positioned. Both Corinthian & Composite entablatures are the tallest of all the orders at a height of 2 diameters, and consist of 3 main parts (bottom to top): the architrave, the frieze, and the cornice. The architrave, in regards to detail, is identical to the Ionic architrave – having 3 fasciae that overlay on each plane and have little to no decoration. The frieze was typically plain or either featured a continuous panel of sculpted ornamentation. The uppermost part of the entablature, the cornice, was the most distinct section due to its increased embellishments. It maintained the use of dentils but also incorporated the use of bracket-like decorations that were situated under the corona and evenly spaced along the spans of the entablature. The cymatium was the top level of the entablature, and it extended past the frieze. 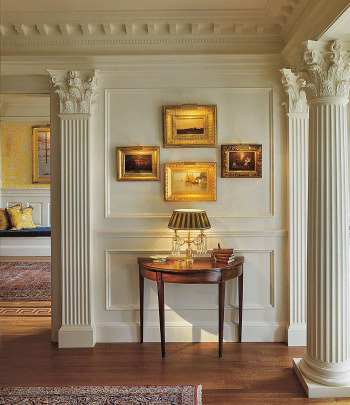 Overall, the Greek Corinthian Order displays elaborate decoration that reflects a sense of lavishness and luxury. 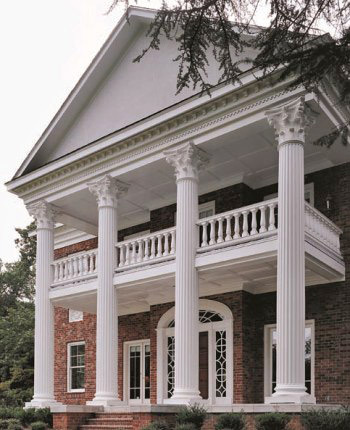 Corinthian columns are versatile because their style can adapt to a wide spectrum of applications – and according to Vitruvius – Corinthian columns represented the delicate and pristine nature of the female persona. 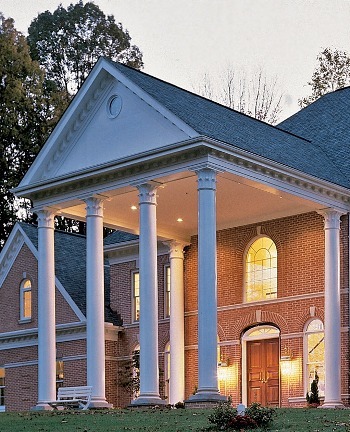 As so, Greek Corinthian columns are best utilized for projects that call for supreme opulence and prestige. Roman architects established a deep affinity for the Corinthian Order because of its elaborate decoration, elegance, and versatility; the order quickly became a Roman favorite and was vastly utilized for structures and buildings that were constructed to honor deities. The Corinthian archetype the Romans fancied was seen at the Temple of Zeus Olympios in Athens, and it was this order that was predominately implemented during the Empire. A fun myth of the order’s origin is described by Vitruvius about the Athenian sculptor, Callimachus. It is said that as Callimachus walked by the grave of a young Corinthian girl, he noticed a possession-filled basket placed atop the grave directly above the root of an acanthus plant. The leaves grew to surround the basket, which was topped off with a flat, square tile that protected the goods inside. This event is mythically said to have been the inspiration for Callimachus’ invention of the Corinthian capital, and interpretations of the capital have been sketched to show what Callimachus saw. 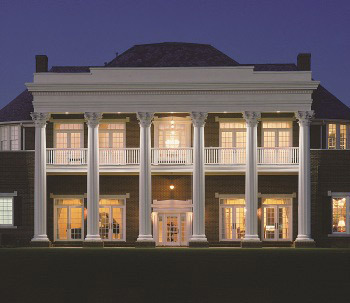 Details within the Corinthian Order, in essence, owe their beginnings to their Ionic predecessors. The order is classified by slender proportions and has a column height of 10 diameters, while the column shaft is predominately fluted (24) times around with the flutes being rounded off before meeting both the capital and the base. Typically, a Roman Corinthian column is fluted, but there are several examples – one being the Pantheon – where the Romans left the shaft unfluted. Post-Renaissance, fluting was considered optional for Roman Corinthian columns. The column shaft terminates downward to an Ionic (or Attic) base that consists of two convex tori (an upper and lower ring) that are divided by a concave section called a scotia. The Corinthian capital is undoubtedly the most discernible aspect of the order, and the Roman Corinthian version varied greatly from the Greek version. Standard, though, is the inverted bell-shape platform that is separated from the column’s shaft by an astragal molding. The usual Roman Corinthian capital consisted of two tiers (as opposed to one tier by the Greeks) of 8 acanthus leaves in each tier. NOTE: the species of acanthus leaves used on the Greek & Roman Corinthian capitals also differed. The Acanthus spinosus was likely the model for the Greeks due to its spikier and taller characteristics, and the Acanthus mollis was likely the model for the Romans due to its more blunt leaf ends and shorter height. Above the upper level of acanthus leaves, rise 8 caulicoli that form the third tier of leaves and encircle the capital. The upper portion of the caulicoli transition into helices that are positioned to support the diagonals of the abacus that has (4) concave sides that curved outwardly to a point. Each face of the abacus is adorned with a centrally-placed fleuron ornament. Both Corinthian & Composite entablatures are the tallest of all the orders at a height of 2 diameters, and consist of 3 main parts (bottom to top): the architrave, the frieze, and the cornice. The architrave, in regards to detail, ranged in design – from generally plain designs to extravagant ornamentations. The frieze typically featured a continuous panel of sculpted ornamentation. The uppermost part of the entablature, the cornice, was the most distinct section due to its increased embellishments. It maintained the use of dentils but also incorporated the use of bracket-like decorations that were situated under the corona and evenly spaced along the spans of the entablature. The cornice showcased a vast repertoire of circular ornamentations and modillions, that were highly enriched with acanthus designs. The cymatium was the top level of the entablature, and it extended past the frieze. 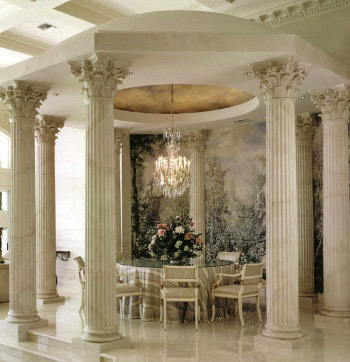 Overall, the Roman Corinthian Order displays sumptuous decoration that reflects a sense of lavishness and luxury. 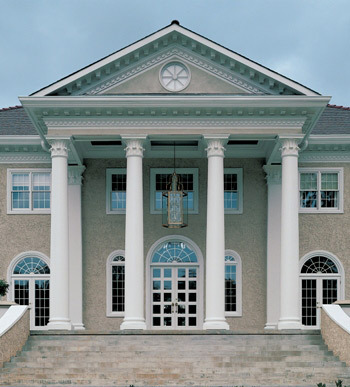 Corinthian columns are versatile because their style can adapt to a wide spectrum of applications – and according to Vitruvius – Corinthian columns represented the delicate and pristine nature of the female persona. As so, Roman Corinthian columns were favored for use on religious, civic, and imposing buildings; they are best utilized for projects that call for supreme opulence and prestige.